If you identify as a part of the LGBT community, there’s a good chance that inclusion and friendliness towards LGBT students is a significant factor in selecting a college or university. Rankings for LGBT-friendly colleges are actually quite common. There are lists printed by Newsweek, The Princeton Review and several other news outlets every year. In addition, gay rights advocacy groups also publish lists of their own on occasion. Unfortunately, many of these lists contradict one another, and there’s no simple system to follow for ranking various colleges. That’s why we’ve put together our own list. We’ll explain why each school is included to help you understand just what you can expect on campus. What Makes a School LGBT-Friendly? Just about every school on those top LGBT-friendly campuses lists has great policies and options for LGBT students. But what are the real facts behind the rankings? The following are our top 10 colleges for LGBT students, along with the details about what makes them different from just any other campus when it comes to LGBT inclusion. 1. University of Michigan: U of M offers almost 20 LGBT student groups and an LGBT studies minor at both the undergraduate and graduate level. It also boasts the first LGBT University office in the country, which was formed back in 1971. There are even gender neutral bathrooms on campus. 2. University of Washington: Both the State of Washington and UW have clear anti-discrimination codes regarding LGBT individuals. UW also has a Queer 101 class offered twice each year along with excellent resources for LGBT students, such as the Q Center. 3. Stanford University: This prestigious school has an LGBT studies program along with regularly planned LGBT social events. In addition, Newsweek found that a remarkable 92% of Stanford students say the campus is “very accepting” of minority students. 4. 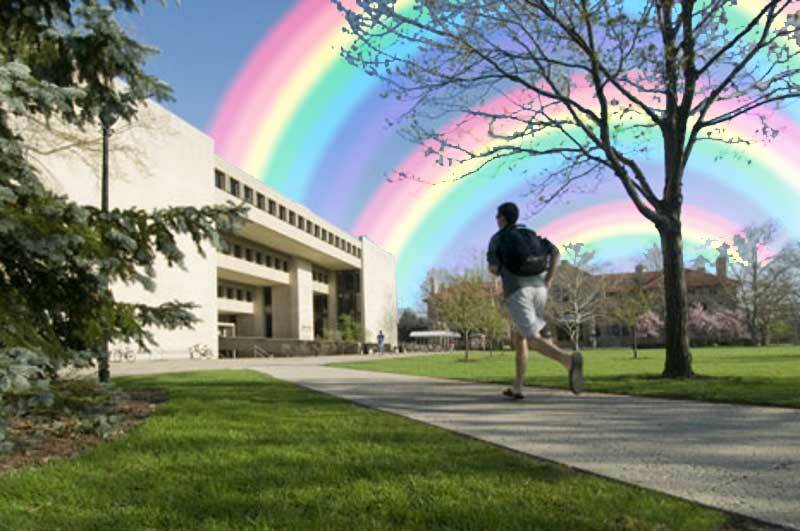 Ithaca College: Ithaca’s campus boasts numerous LGBT student organizations, events and educational offerings year after year. In addition, Ithaca, New York is a notably LGBT-friendly town that offers LGBT sports leagues, support programs and social events. 5. Syracuse University: In addition to an LGBT Studies Program and minor, students at Syracuse can also access a mentoring program for LGBT students and several off-campus resources, such as Sage Upstate. 6. Princeton University: Princeton has a nationally recognized LGBT Center that offers support, training and social programming. The school also offers a post-doctoral fellow in LGBT Studies, numerous LGBT student groups and an LGBT Peer Educators Program. 7. Pennsylvania State University: Penn State offers a great mentoring program for LGBT students. Transgender undergraduate and graduate students on the university’s student health insurance plan are even eligible for hormone therapy as part of their regular coverage. 8. Massachusetts Institute of Technology: MIT’s Rainbow Lounge is an on-campus safe space and support resource for LGBT students. In addition, a student-led survey at the school revealed positive sentiments toward LGBT students in undergrad residences. 9. University of Maryland: This school’s LGBT Equity Center is an excellent resource for LGBT students. In addition, UMD has created an award-winning first-year experience for LGBT students. 10. University of Southern California: USC offers numerous resources for LGBT students, including a peer mentoring program and a leadership retreat. It also has an LGBT-themed housing program called Rainbow Floor. Don’t base your college selection entirely on rankings like these. A Washington Post article on the topic suggests first looking for academic and social offerings that meet your needs, and then comparing them with the rankings to learn more. It might be a good idea to set up a meeting with the LGBT center or student group during your campus visit to learn more about what to expect as a student. Though these schools rank among the best, there are hundreds of schools that are now considered to be LGBT-friendly. Don’t assume that just because a school isn’t on the list that it isn’t a good place for LGBT college students.